Author and poet Larada Horner-Miller spent 27 years as a middle grade teacher before getting serious about writing. Whether through poems or prose (or three volumes of her grandmother’s recipes), she celebrates family and the small ranching community where she grew up. The historical novel When Will Papa Get Home? 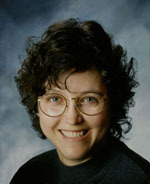 (2015) is her sixth published book. You can find Larada at LaradaBlog and Larada.wix, and on Facebook and Twitter. What is your elevator pitch for When Will Papa Get Home? Having come from Mexico to a homestead on the high plains of southeastern Colorado with her family, Maria is determined to rise above prejudice and other obstacles in this engaging historical novel. When readers turn the last page, what do you hope they will take away from it? I hope the reader takes away a respect for Maria’s struggle and how she worked through a horrible injustice to her family. I also want people to want more about Maria, her family, and what happened next. The spark for this story was a routine visit to my favorite homestead on our family ranch, the Philly Place. I had heard the tales about Philly my whole life from my Dad and Granddad. Philly was accused of being a cow thief and was in jail when my granddad bought his homestead. I found a blue marble between the front door and the outside step and wondered who the marble belonged to. This story came from that familiar tale and that blue marble. Tell us about your main character in When Will Papa Get Home? The story unfolds through the eyes of Maria, the daughter of Philadelphia Gonzales. We meet her initially as a grown, successful woman in Denver, Colorado. In a flashback, Maria tells the story of her family’s immigration from Mexico to southeastern Colorado and her life on the plains living in a homestead. The story focuses on her struggles and finally her maturation through the false accusation of her father being a thief, his imprisonment, and her life with her mother without Papa. Explain the importance of the book’s setting. 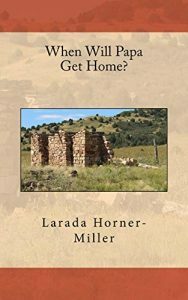 The setting for most of the story is a homestead on our family ranch in southeastern Colorado, and then the move to Trinidad, Colorado. Maria loved the life on the open plains with its freedom and abundant wildlife. Her horse, the land, and working beside her Papa nurtured her soul. The abrupt thrust into the city life of Trinidad jolted her. She yearned for bygone days that were less stressful roaming the mesas she loved. The contrast between the two settings illuminates the two lives Maria lived as a child: from carefree and open on the plains to the confined regiment of city life with schoolwork consuming her. Her major goal in Trinidad was to learn English and better herself so she didn’t end up like her Papa—defenseless because he didn’t speak English. She also focused on becoming literate in Spanish, to be truly bilingual at a time when being bilingual had little merit. I started the book in 1983 while attending Colorado State University as an English major. I revisited the story periodically and edited the 10,000-word manuscript several times over thirty years, but stalled out in the editing cycle. When I retired in 2013, I finally got serious about my writing. In 2014, I self-published This Tumbleweed Landed, a memoir collection of poetry and prose about the same ranching community in my novel. After that successful self-publishing experience, I worked for a year to beef up When Will Papa Get Home? I added references to historical figures, and the complete immigration from Mexico to Mora, New Mexico, and then to Branson, Colorado. I also added the details of building an adobe-and-rock homestead house and outhouse. I researched these keys points, made several road trips, and took photographs for historical accuracy. A photo album was included at the end of the book to provide visuals. Finally, When Will Papa Get Home? was released in November 2015. 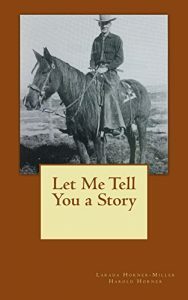 Your publication Let Me Tell You a Story is a booklet written from your father’s perspective recounting the facts of how your grandfather put a family ranch together during the Great Depression. What was your goal in publishing this booklet? My mother and I put Let Me Tell You a Story together for my Dad’s 75th birthday in 1993. My Mom wrote out the story as my Dad told it to her. Then I typed the manuscript on the computer, and Dad and I edited it. He selected the pictures included in the booklet, and initially we printed just enough copies for our family and close friends. After selling 25 extra copies, I republished it on CreateSpace. My Dad was so proud of his father’s accomplishment of putting together a ranch during the Depression when others were losing theirs. This booklet was a celebration of that success story. What authors have had a strong influence on you or your writing? Tony Hillerman’s celebration of the Southwest and the Native American world deeply touched me and encouraged me to write about an area of the Southwest I know and love. As an English major, I took extra classes to study Shakespeare and loved his playfulness with language. Mary Oliver focuses on nature in her poetry—growing up in southeastern Colorado gave me every opportunity to enjoy nature at its best, and I’ve enjoyed adding nature scenes to my books. I am a poet first and that influences my word selection. I have adopted the slogan, “Words matter” as my blog slogan and that says succinctly what counts in writing whether it is poetry or fiction. Also, I have been told the imagery in my historical fiction reminds the reader of poetry. I wrote two books and waited 30+ years to publish them. Don’t wait! I stashed those manuscripts away in a desk drawer for years, but they were not silent. They whispered to my spirit, but I ignored them. I married. I divorced. I walked away, turning my back on my creations. I sent out a query letter on This Tumbleweed Landed and received a request for the full manuscript. Then came the rejection—that put an end to my writing career for several years. I filled my life with other activities, but my books kept up their vigil. They haunted me, wanting to be released from that dark prison. Finally I couldn’t stand their noise anymore. Their endless clamor ended because I listened. My new book, I Grew Up to Be the Woman I Always Wanted to Be, will be released May 2017. It is a grief memoir of poetry and prose about the loss of my parents and how I handled it. It offers ideas on how to handle being an adult orphan and coming through to the other side.